nSusan Delafield is a long storing Porcelain garlic rich garlicky flavor and warm to hot pungency that grows well in most places that have anything resembling a cold winter. Harvests in July/August and stores all winter long and into spring. 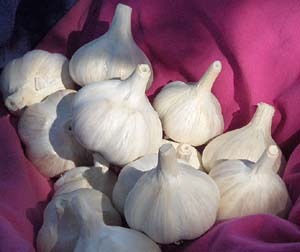 Susan Delafield is a beautiful very deeply rich flavored and moderately pungent Porcelain garlic that reminds me of Rosewood but grows bigger and is an excellent all around garlic that stores well. It has very white parchment-like bulb wrappers and tight, thick, dark reddish-brown clove covers and can grow very big. 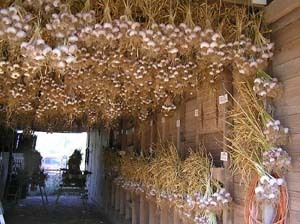 Susan Delafield was developed in British Columbia, which is where Karen Dickson of Garlic Mountain obtained her seed stock and has successfully grown very large to huge bulbs and thanks to her, those big beautiful firm bulbs are now available grown Certified Organic in this country. 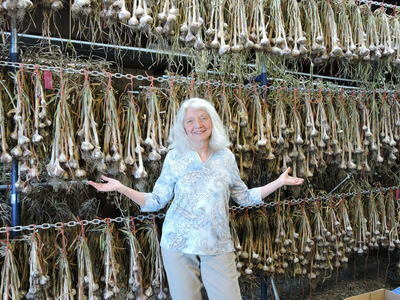 Susan Delafield will probably be one of the taller garlics in your garden and grows well in most of the USA except the warmest winter areas of the country. ​ the only Certified Organic US grower who is growing it. This page added March 31, 2019 - updated April 3, 2019.